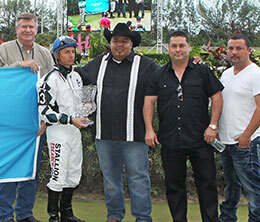 HIALEAH, FL�JANUARY 17, 2016�Moonin The Eagle got his first stakes victory Sunday after kicking clear of Tf Cajun Cartel by three-quarters to win the $204,310 Hialeah Maturity at Hialeah Park. Rf Me Leaving You finished half-a-length back in the show position. Ridden by jockey Ricky Ramirez, Moonin The Eagle broke second but gained his stride before pulling way in the classic 440 yard race. He recorded a :21.201 clocking to earn a 105 speed index with the aid of a 16 mph tailwind. Rolando Amanza saddled the son of leading sire One Famous Eagle to his fifth career win for owner Gregorio Garcia Garza. Bred in California by Vessels Stallion Farm, LLC, Moonin The Eagle pocketed the winners' purse of $85,810 to bring his career mark to nearly $310,000. Moonin The Eagle, out of the champion First Down Dash mare Your First Moon, is a half-brother to last year's champion 3-year-old Moonist. He has compiled a (12) 5-2-1 record. Stakes winner Tf Cajun Cartel had good speed, under jockey Tanner Thedford, but was out-finished and had to settle for the second place purse of $36,777. Fernando Carrete conditions the son of Corona Cartel for himself and Ascencion Fernandez. Bred in Louisiana by Steve Tate, from the Mr Jess Perry mare Dashadee, Tf Cajun Cartel has earned $156,341. Last season Tf Cajun Cartel won the Corona Cartel Invitational Stakes at Ruidoso Downs and was second in the Grade 1 Texas Classic Derby at Lone Star Park. Judd Kearl saddled Rc Me Leaving You to his third place finish for owners Teresa and Bennie Jeter. R C Running Horses bred the Coronas Leaving You colt in Texas from the Streakin Six mare Sixy Bottom. Ridden by Rodrigo Vallejo, the graded stakes-placed colt was also third in the Grade 1 Texas Classic Derby at Lone Star Park in November. The $24,518 third-place check boosted his career total past $101,000. Rattle N Battle, Yurman, Premier Ethics, De Mille, Marva Vegas, Seize The Win and A Royal Fling completed the field.